Engraving a pattern into concrete creates a long-lasting, easy-to-maintain alternative to regular concrete. Concrete engraving can transform your concrete into a work of art! Consider saw cutting a brick or flagstone pattern as a decorative border for your concrete patio. Company logos can be installed in concrete using concrete engraving and saw cuts. 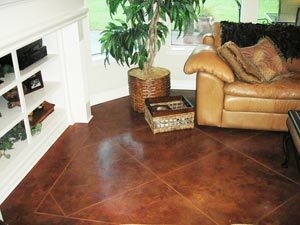 Adding a color or colors with stain after engraving a pattern will make your concrete design really pop. There are unlimited patterns and stencils available for concrete engraving and saw cutting. Choose from a simple, elegant design or choose a bold, abstract pattern with free-flowing curves to create an extraordinary impression. Acid etched finish of concrete surfaces removes the cement to expose the sand that gives a sparkle to the concrete surface. If you want a little deeper finish, but not exposed aggregate, we recommend a sandblast finish, which has less of a sparkle then acid etched, but gives the concrete surface more traction. It depends on the project and your preference. When acid etching or acid washing concrete, it gives your concrete an attractive finish and texture. 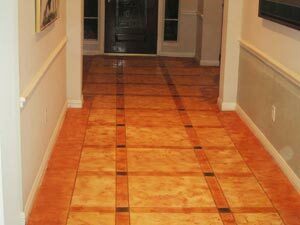 Impressions in Concrete is a concrete contractor that has done many acid etched concrete finishes with beautiful results. After new concrete has been poured and a smooth steel trowel has been applied, an acid etched finish can be done, usually the next day. Acid etching gives a rustic and yet modern look to your concrete finish. It especially looks great with colored concrete. 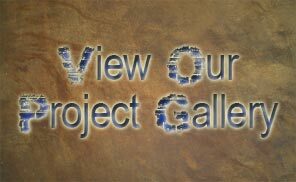 Custom Etched or Engraved Concrete can set your home or business apart from the norm. A truly ONE OF A KIND service, concrete etching or engraved concrete will allow you to add your company logo, create custom designs, murals, floral shapes, tile or brick designs….you have unlimited potential in design that is only limited by your imagination. Whether you are pouring a new floor surface, or if your floor already exists, we can beautify your home or business with an elegant, easily maintained, and energy saving etched concrete floor design that is customized to your desires. 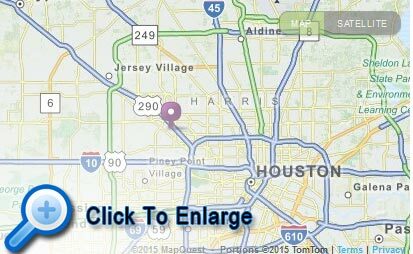 Fill out the information below, and one of our concrete design experts will be in contact with you, or call us at 713-682-8337 for assistance.